Simone is a sweet, rosy-cheeked little girl. Maurice is a green, googly-eyed monster. 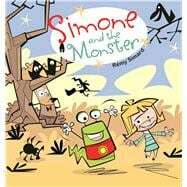 When Simone enters Maurice’s world, she strikes terror in monsters’ hearts! Here, the rules are turned upside downflowers, puppies, and good behavior are the stuff of nightmares, and all things scary and icky are adored. Each page in this comics collection tells a different mini-story featuring Simone and Maurice in four to six panels. Despite (and often because of) their differences, they have hilarious adventures together. Bold, vibrant cartoon art and speech bubbles with plenty of sound effects make punchlines simple to grasp. Single-page stories feature various seasons, holidays, activities, sports, and school, making this a fun, relatable pick for emergent readers seeking an entry point to graphic novels. Rémy Simard has published more than 80 children’s books in French and English. His illustrations have also appeared in Today’s Parent, Reader’s Digest, Maclean’s, The Globe and Mail, and La Presse. He lives in Montreal, Quebec.